Home » Pregnancy » Top 5 Items ALL Pregnant Women NEED! Top 5 Items ALL Pregnant Women NEED! Make life more comfortable with these necessities! Ah the miracle of creating new life can take quite the little toll on your body! Growing a baby is quite a task….I mean it is something only us women are strong enough for….right?! 🙂 But, we have to remember to take care of ourselves as well….especially the second, third, fourth….whatever time around! I can tell you….this second pregnancy is NOTHING like my first! I don’t know if it’s because I’m getting older, or if it’s because I’m having a girl and she’s trying to break me before she gets here, or if it’s just my body saying ENOUGH….who knows….all I know is that I need a little extra TLC this time around! So today I’m going to share with you my Top 5 Items that make pregnancy a little more comfortable and that no prego lady should be without! Alrighty, what are the top 5 items all pregnant women need? If you want a good night’s sleep you MUST get one of these! I personally LOVE the Snoogle. I bought one when I was pregnant with Little Man and it was a life saver! I’m a stomach sleeper and I could NOT get comfortable at night….I would toss and turn and wake up all grouchy….until I got the Snoogle. Hubs calls it my little nest. I’ll get it all twisted around me and supporting the right spots so that I can get comfy….unfortunately for him, it creates a bit of a fortress in our bed that he can not enter no matter how close he scoots! But I sleep like a log so I’m happy! The Snoogle is big enough to wrap and get the support I need and the price is great for a pregnancy pillow this big. Getting one of these was a MAJOR help during this pregnancy. It seems with number 2 (and so on) you’re muscles aren’t as strong as with the first baby so you have a NEED for extra support. I swear….this kid is sitting so low that I sometimes feel like she’s just going to pop her head out to say “hi mom!”. And I wonder how much better it would have been if I had one of these with Little Man….I’ve heard that a belly support band can help with stretch marks! WIN! But seriously, it truly does help with pelvic pressure, hip pain, sciatic nerve pain, lower back pain, and even the pregnant waddle. The good news is that many health insurance companies will cover the cost of a belly support band for pregnancy when your doctor writes a prescription. So, talk to your doctor about getting one….it really does help! My favorite is the belly support band that looks like this. You can find them at Babies R Us, but if you can stand waiting the couple of days I would order one off Amazon…the price is better and you have more selection….although not much. I prefer this style because it offers the best support. With the ones that just rest on your hips and “hold up” your belly they tend to stretch throughout the day and not give enough support. This style gives plenty of support and is adjustable so you can customize it as your belly grows. And don’t worry….the straps aren’t really noticeable through your shirts. I bought mine while attending a blog conference because we were doing a LOT of walking and I needed something ASAP…even though I had form fitting shirts no one noticed. This is especially helpful if you already have a toddler running around. A diaper bag can be such a pain to keep up with! By using a backpack diaper bag you can just strap it on and chase after your little one with no worries. I found that having both arms free made it so much easier dealing with Little Man when we went to the park, mall, Target, grocery store, etc. Plus, when you’re pregnant you just don’t feel like holding on to anything else. By using a backpack diaper bag while pregnant you free up your hands so you can do more important things…..like eat another ice cream! Personally, I’m completely in LOVE with the Ju-Ju-Be backpack because it’s cute, stylish, has plenty of compartments, and is super sturdy! I also love this Abonnyc rugged backpack because it’s roomy, has lots of compartments, is a great price and it’s perfect for dads too! If you suffer from sciatic nerve pain or any back or hip pain this is a MUST have for you! I bought this set on Amazon when I was pregnant with Little Man because I had HORRENDOUS sciatic nerve pain! Every night I would be in such pain before bed that Hubs would have to rub my back and hips for at least an hour! 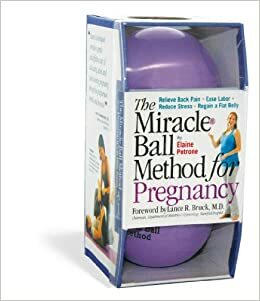 Once I bought The Miracle Ball Method for Pregnancy and learned some of the movements I was able to release the tension on my own….although I still insisted on the occasional back rub….just not EVERY night. 😉 Even with this pregnancy, I’m not experiencing any sciatic nerve pain but I do have some intense hip pain and pelvic pressure. By just using the balls for 10 minutes every night I feel so much better! This stuff is AMAZING! My belly is in CONSTANT itch mode these days! It doesn’t matter how much lotion I put on my skin is dry and itchy within an hour or so. I put it on in the morning and my skin feels hydrated all day. Then I just put it on before bed and I’m no longer scratching like a mad woman! But you have to make sure that you get the Burt’s Bees Mama Bee Belly Butter….I’ve tried the other stuff and the butter is the BOMB! You can also use the Mama Bee Body Oil…it doesn’t work as super awesome as the belly butter but it’s pretty darn close! Do you have any MUST HAVE items that you can’t live without when pregnant? Share in the comments below! Thanks so much! I LOVE the Burt’s Bees Mama Butter!! You should also check out this list of Free Stuff for new moms! Congratulations on your little bundle of joy….it’s so exciting!! !